Former FBI Director James Comey illegally kept two sets of records at the bureau – one that was fake and for public and media consumption – and another that was real and only available for the upper echelon at the agency. 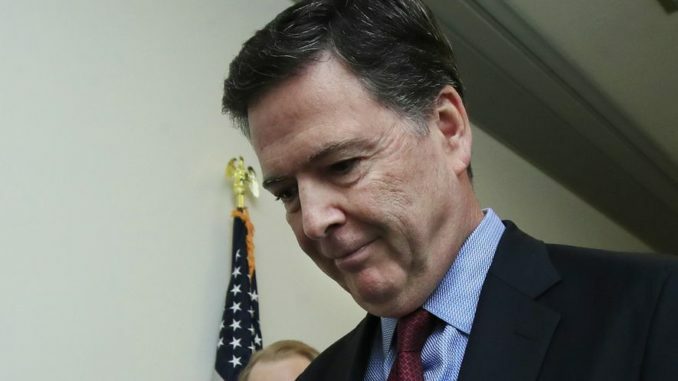 According to national security expert Sara Carter, Comey could be in deep trouble for attempting to obstruct justice during his tenure at the FBI. 100percentfedup.com reports: Hannity started his show by addressing the stonewalling of the FBI and DOJ of Trump’s order to declassify and release unredacted documents related to the Russian collusion witch hunt. Fox News legal analyst, Gregg Jarrett, told Hannity that President Trump has the Constitutional authority to demand that the documents are declassified and released, and if they decide to defy the President, they should be fired immediately. “I will not name names until all of the evidence is out there, but there were certain people above Peter Strzok and above Lisa Page that were aware of this,” Sara said.